Pumpkin stew is not a dish I’m familiar with. To tell you the truth, this is the first time I had pumpkin in a stew form, but it won’t be the last time! It was incredibly tasty and filling, so I will be making it several times this year. 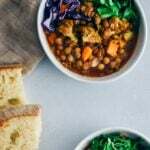 I’ve always love the combination of green lentils with vegetables as in Eggplant with Lentils, which is a wonderful vegetarian dish, so this pumpkin stew, which is a heritage from grandma, has already become one of my favorites! When I asked mom if she knows any savory pumpkin recipe, she said her mom used to make a pumpkin stew with green lentils and chickpeas. Pumpkin in a stew? 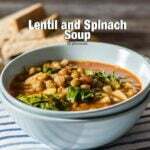 It didn’t sound like a must try recipe at first, but when I heard that it would be combined with green lentils, I was in. Mom wanted to make it herself, so I couldn’t wait to taste it the following day when a very tempting smell from the kitchen filled the home. It was like there was my granny in the kitchen! She was such a talented cook and her dishes always made me feel peaceful. 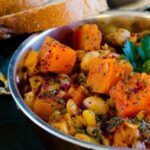 Lentils and chickpeas go amazingly well with pumpkin and make the stew a heartwarming savory treat, just perfect for the last month of Fall! Another ingredient that must be added into it is a good amount of dried mint as it makes the stew even more appealing. You can either add it into the stew when cooking or right before serving. Also, you will love the sumac addition on the top. Sumac gives a very nice sour taste to the stew. Dried mint and the sour flavors inside the stew will make a great touch! So this pumkin stew is not only a scrumptious vegetarian dish but it is also a classic recipe reminding me of my grandma. 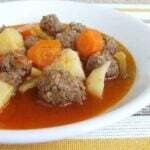 When it’s getting cooler these days and closer to Winter, I’m sure you will be satisfied with my gradnma’s pumpkin stew! 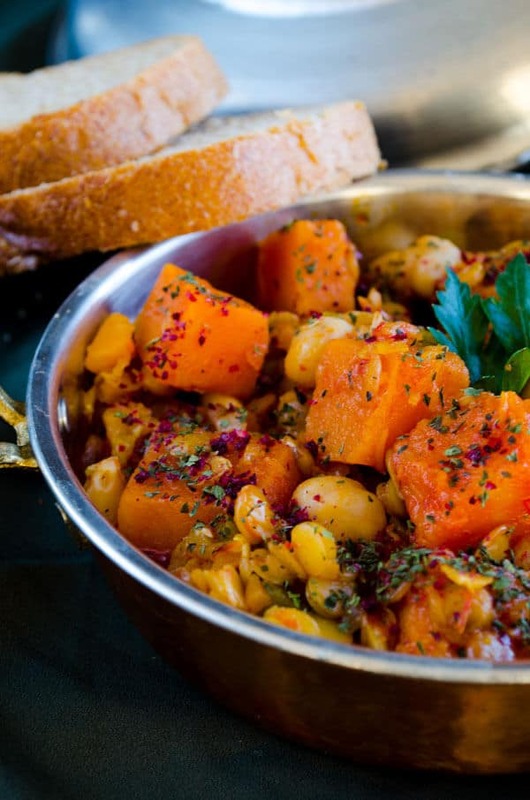 A flavorful and filling pumpkin stew with lentils and chickpeas. Heat olive oil in a pot and saute onion in it. Add tomato and pepper paste, stir. Toss in green lentils and boiled chickpeas, stir. Toss in pumpkin cubes, chopped pepper and garlic cloves. Stir for 2 minutes. Pour hot water into it, squeeze a lemon and season it. Cover and cook over medium low heat about 30 minutes until pumpkin cubes and lentils are done. Serve with a little dried mint and sumac on the top. This looks interesting. In which step do you add the pumpkin? Thanks Tamara for this comment! I just forgot to write the step of pumpkin, add them with peppers and garlic. I added it in the recipe now.